← How Do We Organize A Hundred Million? Second post in the series: How Do We Organize A Hundred Million? The inside/outside strategy is a way to learn as events unfold. It is important that we learn from, work with, and leverage positions we do not entirely agree with.1 Otherwise we are assuming we have already arrived at the “Truth,” when the state of the world — and the state of the movement — strongly suggests otherwise. The most important political consideration is this: millions of Americans are learning the power of the people. We are learning that engagement, activism, participation and contest produces power, not silent consent or the passive consumption of whatever the machines offer. The people can make history. The Sanders campaign is a school and it needs to remain in session. The inside/outside strategy recommends diversity in organizing methods and approaches. So let’s try to learn the inside/outside strategy from the historically unprecedented presidential campaign of Bernie Sanders. Sanders starts from a position outside of, or on the very margins of, the Democratic Party. Without his decades as an independent and social democrat, Sanders would not have the capacity to give voice to long-standing grievances or propose policy solutions. That independence is the ultimate source of his appeal. 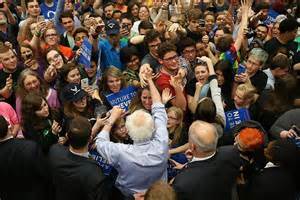 Sanders independence from the big money and the big machine won the hearts and minds of millions by proving it was possible to be an honest leader with a positive view of the future. Yes, he ran as a Democrat, and we do risk him bringing some of his supporters back into line. But it is also his best first path to the presidency. It’s a gamble we will have to take and an offer we cannot refuse. While we cannot predict the future, contingency planning is essential. As of May 2016, victory is still possible and appears more probable. It is vitally important that Sanders activists push hard to win the nomination. In addition to the mountain of evidence that Clinton’s politics will keep us on the path to disaster, Clinton is looking more and more the loser against Trump. The email scandal, election fraud, and a pattern of deception and lies in the face of the State Department report; the Clinton machine seems hell-bent on self-destruction. The inside/outside strategy is demanding. The Sanders surge must pull out all stops on the remaining primaries, court the super-delegates with promises and threats, step up political criticism of the Clinton machine, build for massive protests in Philadelphia, while simultaneously exploring the possibility of a Sanders/Stein ticket. We could, after all, also win with a Green Sanders. The question is not whether we need a new political system: the question is what is the path forward. The Bernie or Bust Pledge, over 100,000 strong, is pushing for Sanders or Green Party in case he does not win the Democratic nomination. Bernie or Bust is a leading example of strategic intervention aimed right at the nub of conflicting possibilities. Socialist Alternative is also sponsoring a petition to encourage Sanders to run as independent or Green. Still, without the Democratic label the already stunting media blackout and bias would have been total censorship. Organizers and activists would still be searching for the millions of people Sanders has led in a revealing and educational electoral struggle. And who can deny the fact that the Sanders campaign has made democracy, corporate influence, socialism or the crisis of the two-party system itself a greater subject of public discourse than any movement since Occupy at least and perhaps since the Sixties? Without the Democratic run the Sanders surge would have faltered on the single quality most lacking the Greens and the social movements generally: a path to power that people can imagine as possible. Starting with an independent campaign, as many radicals called for, would have presented nearly insurmountable obstacles in reaching the public. Even as a Democrat, electability was the single greatest objection everyday people raised against Sanders. Electability/viability/inevitability are central narratives for the corporate media for a reason: “inevitability” is a social control discourse limiting the expression of alternatives and the building of social movements alive with purpose and confidence. In overcoming, or at least weakening, the electability discourse by expanding the horizon of what is possible, the Sanders campaign has paved the way for other challengers. The Green Party, better positioned for growth than ever before, can win the 5% necessary for federal funding. 5% is a stepping stone to becoming a truly national party if the Green Party can learn to leverage the Sanders surge; regardless of outcome. The Sanders surge is an unmistakable sign that millions of Americans, the young most of all, agree with Green Party values and ideals. But, how could Sanders, or we, make the most of this campaign without trying our best to win the Democratic nomination? It is by pushing on to victory — or the bitter end — that millions of people will learn through their own experience the depths of corporate control and corruption of the electoral process. The now likely contested convention is also fraught with risks and possibilities, but the massive demonstrations already planned for Philly are the most productive movement response. Afterwards, we can update strategy based on the new facts on the ground. Revolutionary strategy demands that we embrace Sanders’ contradictory role and make the most of it. It is precisely because Sanders gives expression to contradictory impulses and trends that millions of people can see him as a heroic figure. That makes Sanders the most important political leader in the US, win, lose or draw. It is up to the social movements to strengthen the “outside” with vigorous resistance movements, civil disobedience and constructive alternatives. It is not a coincidence that the Communication Workers of America, had the vision to both wage and win a historic strike and to support Bernie Sanders when many unions caved into the Clinton machine and lowered expectations to incremental change. How can we fight for $15 without fighting the machine? Every twist and every turn holds an organizing opportunity if we can clear our minds from the straight and narrow. The challenging part for organizers is to not give into the comfort of ideological clarity, easy answers, or machine politics. Stay in the discomfort zone. That is where strategy is discovered because contradictoriness is the actual condition of all social movements. And strategy must emerge from the material conditions at hand. Can we can see beyond black and white, in or out, good and evil? Static binaries, like “either/or” will not serve us well. Can we master the demanding “both/and” approach of the inside/outside strategy as well as Bernie has? Is Sanders a transformative leader or a “sheepdog” propping up the Democratic Party? The answer to that is not just Sanders to make. It’s what we do that matters. If we “learn from the Bern” we should learn that political judgements are best made in the thick of it. The revolutionary organizer is simultaneously insider and outsider. The inside/outside strategy values organizing and experimentation over the perfect but sparsely populated landscapes of the mind. If not ideological measures or machine politics, what concepts might help us to frame the way forward? Universal values. 1.The inside/outside strategy is a dialectical approach to action. Opposition and multiple viewpoints gives us a lot to learn from. And learn we must, because strategic organizing is the most challenging form of thought-in-action and the most needed. This entry was posted in Electoral Strategy for 2016, Movement Culture, Organizing Method, Organizing Strategy, revolutionary strategy, Strategy, Uncategorized and tagged American Revolution, Electoral Strategy for 2016, Movement Strategy, Organizational Culture, organizing. Bookmark the permalink.